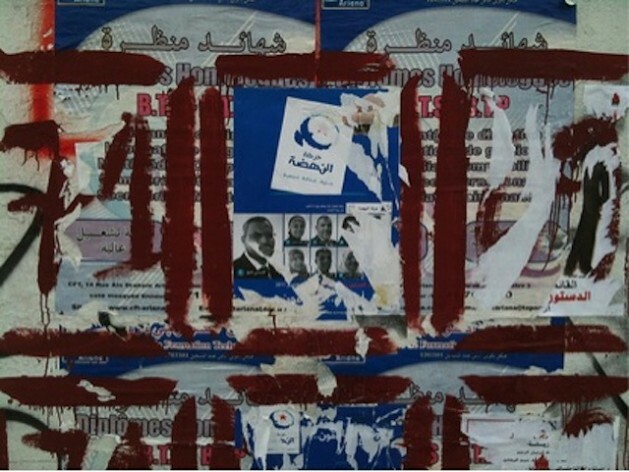 An Ennahda poster in Tunis. Credit: Jake Lippincott/IPS. TUNIS, Nov 26 2012 (IPS) - A year has passed since the provisional government assumed power in Tunisia. Following in the wake of the revolutionary changes brought on by the Arab Spring, the moderate Islamic Ennahda party won the majority and formed a coalition with the two secular parties Congress for the Republic (CPR) and Ettakatol in October last year. With the promise to hold new elections a year later, the country waited as Oct. 23 approached. The day came and went, without the ruling government stepping down. Small protests erupted in the streets of the capital and later elsewhere but there were no large-scale rallies. “I experienced the greatest deception of my life, “a young psychologist and actress from Tunis who gave her name only as Meriem told IPS. Even if the ruling government did not immediately step down, she said, people were hoping for some sign that change was in the works. The ruling coalition has claimed that more time is needed to prepare elections, and has instead pegged Jun. 23, 2013 as the next election date. Usama Zekri, a blogger, stressed that more time is indeed needed to fully prepare for the elections that will usher in the first four-year political cycle. Nidaa Tounes (‘Call of Tunisia’) has generated some of the strongest opposition support recently. The party is led by octogenarian former prime minister Beji Caid Essebsi, and holds to a strict secular line. Nesrine Dridi, a dentist, claims that the best solution for Tunisia would be a secular power structure as envisioned by Nidaa Tounes, leaving religion as a matter of choice. Many in the opposition are worried that while Ennahda espouses moderate Islam, it is actually keen on promoting religion throughout all areas of government and public life. The Salafist movement represents the hardline ultraconservative branch of Islam, but Ennahda can position itself as a moderate strain, needed by all to preserve a balance in the style of governance. In forming the new constitution, Ennahda seemed open to Salafist demands for greater inclusion of Sharia law. But this was quelled by opposition groups and secular parties. This was seen as a warning sign for those who are worried that liberal democratic values might draw the shorter straw. Yet, according to Zekri, the opposition has been too preoccupied attacking Ennahda on the religious front, and could do more to propose an alternative economic programme. In order to fully reassure the country that the democratic evolution is on the right track, the ruling coalition will have to prove that proper steps are being taken. The establishment of the independent Committee on Elections is seen as such a sign, but many have still to be convinced of its impartiality and readiness to get to work. Beyond this, serious progress will need to become evident elsewhere. Among the greatest tasks facing the government are high unemployment and the rising cost of living. In October the Swiss government and the International Finance Corporation granted Tunisia a million dollars to implement business procedural reform. An Austrian trade delegation has visited Tunisia to explore possibilities for Tunisian-Austrian relations. These are just a few of many overtures currently, but it is not clear how all this will translate into jobs and putting more people to work. Tunisians remain in a state of uncertainty, eager for signs that the country is headed in the right direction, and that the blood and sweat of the Jasmine revolution will help cement Tunisia’s place as the best-transitioned democracy in North Africa. For now, the streets remain relatively calm, without large-scale protests taking place, yet President Moncef Marzouki recently admitted to having nightmares of a second revolution. Activists like Meriem are poised to jump into action, if the need arises.